Greetings from Nashville! I’m here with the Teach Them Diligently Conference. Yesterday I taught about 40 Ways to Be Present In Your Child’s Day. I also taught with Kristi Clover about Homeschool Basics. I love, love, love meeting up with friends I’ve met at previous conferences and making new ones! Even as I write this, some of my kids are sitting on our interior balcony at the Opryland Hotel. They love traveling with me and also meeting new friends! I appreciate that my kids get to learn and grow in this environment of being surrounded by other godly families. It’s always my desire that their relationship with God grows … which leads me to the topic of the day, which is teaching our children to depend on God–and God’s peace–more. I have a daily habit that I hope makes a difference in the lives of my kids. Every weekday morning, I read four or five chapters of the Bible, and then I choose a Scripture from that day’s passage and pray that verse over my kids. As I read that passage, I thought about fire … not physical fire, but the fiery trials in my children’s lives. In this world, there are so many things for my kids to worry about. There are child predators and bullies. There are friends who turn out to hurt you. There are broken relationships. There are losses and disappointments. Lord, I know there will be times when my child will look around and see all the evil in this world, and he will question if you care and if you are there. 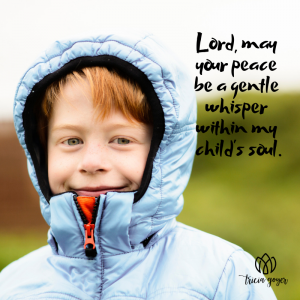 When my child becomes worried that he will be consumed by trials, I pray you will come to him as a gentle whisper. I pray you will be peace within his soul. Today, may my child turn his eyes away from all that worries him and instead focus on your gentle presence inside him. Lord, I know there will be times when __________ will look around and see all the evil in this world, and he/she will question if you care and if you are there. When __________ becomes worried that he/she will be consumed by trials, I pray you will come to him/her as a gentle whisper. I pray you will be peace within his/her soul. Today, may __________ turn his/her eyes away from all that worries him/her and instead focus on your gentle presence inside him/her. As I prayed for each child and grandchild, I thought about his or her individual needs. I also thought about how I long for my children to depend on God. And I realized that teaching this dependence starts with me. I need to pray for peace in God and dependence on Him for myself first. Lord, I know there will be times when I will look around and see all the evil in this world, and I will question if you care and if you are there. When I become worried that I will be consumed by trials, I pray you will come to me as a gentle whisper. I pray you will be peace within my soul. Today, may I turn my eyes away from all that worries me and instead focus on your gentle presence inside me. I need to model dependence on God for my children. Even as I pray for my children, I need to model what I claim to believe about trusting God. My children have a front row seat to how I act and react. They witness if I allow myself to get worked up and worried. If I’m a frazzled mess it’s hard to encourage them to be calm. The best way for me to teach my children to depend on God is to depend on him myself. I need to look past the fiery trials around me and focus instead on God’s gentle whisper within. I need to make time in God’s Word a priority. I am able to depend on God myself when I spend time in His Word. To keep myself accountable (and bless others!) I lead a Scripture Reading Journey in a private Facebook group. Knowing that others are expecting me to post a prayer every weekday keeps me accountable. Then, as I spend time reading through the Bible for myself first, my heart becomes settled. As my heart becomes settled, I am able to encourage my kids to turn their worries over to God, too. I also find myself pausing throughout the day to pray with my children and encourage them. We all need our minds focused on God throughout my day, otherwise our minds fill with worries. Only when we have the peace of God inside us can we pray for our children with conviction. Whatever our kids need, we need first. You can join me in praying for your child through the year in my private Facebook group. Each day the Scripture passage we’re reading is posted, and on most days (just being honest!) I post a graphic and a prayer. Prayer is something important for kids to learn, and I encourage parents and kids to pray together. This prayer journal teaches kids how to pray. Each day in this journal has a place for moms to write their prayers and for kids to write (or draw!) theirs. Scripture passages are also included as prayer prompts. As you can see, it’s my desire to help you to read God’s Word more consistently and pray. I know this practice has helped me to depend on God more. As we seek God together, hopefully we will teach our children to do the same!